Will the last middle-class person leaving Seattle turn out the lights? 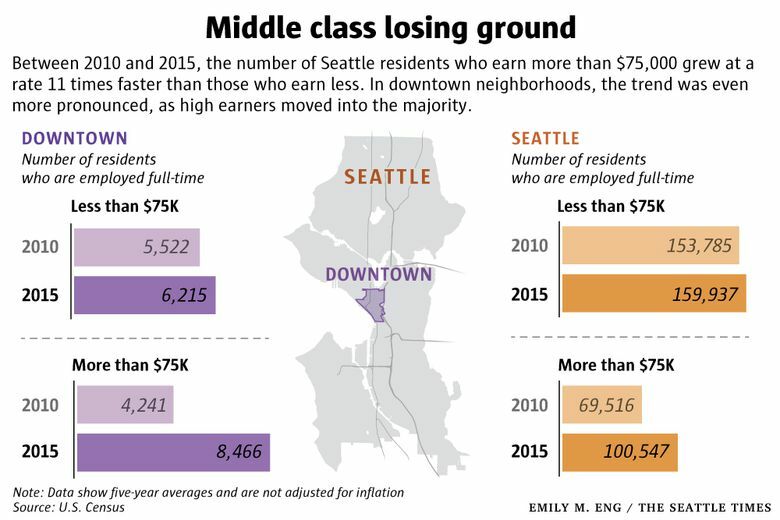 In Seattle’s massive economic and population boom this decade, the middle class has largely been left behind. Between 2010 and 2015, the number of Seattle residents who earn more than $75,000 grew at a rate 11 times faster than those earning less. 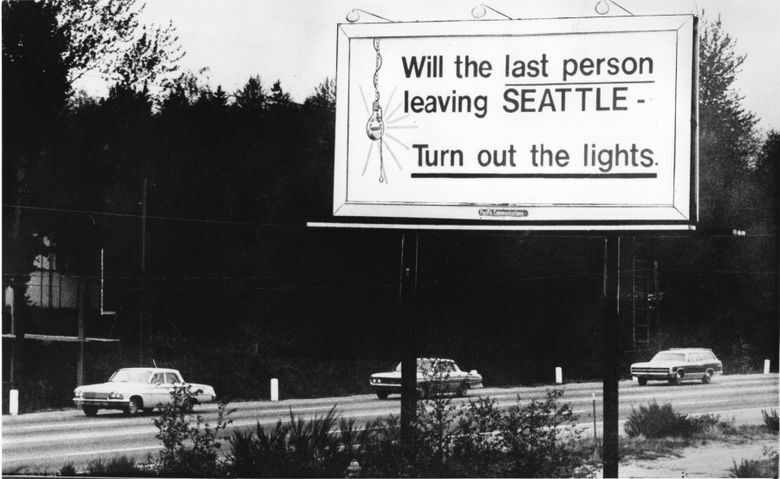 Here’s a twist on the iconic billboard from the “Boeing Bust” era of the 1970s: Will the last middle-class person leaving Seattle turn out the lights? The thought occurred to me after reading about the concerns of some residents of downtown Seattle. They’re worried there will be no place for average earners in their neighborhood after zoning changes, which won approval from the Seattle City Council on Monday, go into effect. With the rezone, developers can build higher, and in exchange, must include affordable units or contribute to the production of low-income housing elsewhere in the city. But some downtown residents argue that this plan leaves out those in the middle. It’s a legitimate concern, and not just for people who live downtown. Data show that since the start of this decade, those with midlevel incomes are fast losing ground to high earners. While the trend is especially pronounced in downtown Seattle, it’s happening citywide, as well. Downtown neighborhoods, including Belltown and South Lake Union, are booming. The number of residents who are employed full-time jumped by 50 percent between 2010 and 2015. But overwhelmingly that growth has come from people with salaries above $75,000, whose ranks doubled from 4,250 to 8,500. Very little of downtown’s growth — less than 15 percent — came from residents with jobs that pay less than $75,000. They increased in number by fewer than 700 in this period. With the surge in high earners, the neighborhood’s demographics have shifted with remarkable speed: Downtown residents earning more than $75,000 jumped from 43 percent of those with full-time jobs in 2010 to 58 percent just five years later. There’s no mystery why. Someone with a salary of, say, $50,000, would be hard-pressed to find an affordable apartment in the neighborhood these days. But there’s no housing shortage for the affluent. A slew of new luxury apartment buildings has gone up to accommodate the influx of well-heeled downtown dwellers. According to real-estate data firm CoStar, 33 market-rate properties were newly built or renovated in downtown, Belltown and South Lake Union since 2010. The average rent for a one-bedroom apartment in these buildings is about $2,300. Downtown Seattle, of course, has a large share of low-income folks, too. More than 5,000 people in the neighborhood — 19 percent of the population — have incomes below the poverty line, according to census data. Downtown has the highest concentration of low-income-housing units in the city. There are 55 multifamily buildings that are either entirely below-market rate or are a mix of market-rate and affordable units, according to CoStar. While we certainly don’t have enough low-income housing to meet the need, “middle-income housing” isn’t even a thing here. Nearly all affordable-housing programs for renters have an income limit no higher than 80 percent of the King County median. That means a family of three with a household income of $65,000, for example, would be out of luck. The hollowing out of the middle class is not limited to downtown. From 2010 to 2015, Seattle added just 6,000 residents with full-time jobs that pay less than $75,000 — a mere 4 percent bump. Meanwhile, the number of high-earning Seattleites grew by 31,000, which represents a 45 percent increase. Census data show that the biggest gains in full-time employment were in management and tech jobs, both of which have median pay above that $75,000 threshold. From a purely economic perspective, it’s a problem that many cities might envy. People with high-paying jobs want to live in Seattle. But a city that prices out its middle class is also a city where the elementary-school teacher — and the firefighter, and the bank teller — probably can’t afford to live in the neighborhood where they work.